The late 1870s and early 1880s saw the introduction of arc lamp lighting used outdoors or in large indoor spaces such as this Brush Electric Company system installed in 1880 in New York City. Electric power distribution only became necessary in the 1880s when electricity started being generated at power stations. Before that electricity was usually generated where it was used. 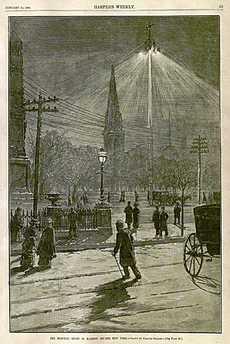 The first power distribution systems installed in European and US cities were used to supply lighting: arc lighting running on very high voltage (around 3000 volts) alternating current (AC) or direct current (DC), and incandescent lighting running on low voltage (100 volt) direct current. Both were supplanting gas lighting systems, with arc lighting taking over large area and street lighting, and incandescent lighting replacing gas for business and residential lighting. Due to the high voltages used in arc lighting, a single generating station could supply a long string of lights, up to 7-mile (11 km) long circuits. Each doubling of the voltage would allow the same size cable to transmit the same amount of power four times the distance for a given power loss. Direct current indoor incandescent lighting systems (for example the first Edison Pearl Street Station installed in 1882), had difficulty supplying customers more than a mile away due to the low 110 volt system being used throughout the system, from the generators to the final use. The Edison DC system needed thick copper conductor cables, and the generating plants needed to be within about 1.5 miles (2.4 km) of the farthest customer to avoid excessively large and expensive conductors. Transmitting electricity a long distance at high voltage and then reducing it to a lower voltage for lighting became a recognized engineering roadblock to electric power distribution with many, not very satisfactory, solutions tested by lighting companies. The mid-1880s saw a breakthrough with the development of functional transformers that allowed the AC voltage to be "stepped up" to much higher transmission voltages and then dropped down to a lower end user voltage. With much cheaper transmission costs and the greater economies of scale of having large generating plants supply whole cities and regions, the use of AC spread rapidly. In the US the competition between direct current and alternating current took a personal turn in the late 1880s in the form of a "War of Currents" when Thomas Edison started attacking George Westinghouse and his development of the first US AC transformer systems, pointing out all the deaths caused by high voltage AC systems over the years and claiming any AC system was inherently dangerous. Edison's propaganda campaign was short lived with his company switching over to AC in 1892. AC became the dominant form of transmission of power with innovations in Europe and the US in electric motor designs and the development of engineered universal systems allowing the large number of legacy systems to be connected to large AC grids. In the first half of the 20th century, in many places the electric power industry was vertically integrated, meaning that one company did generation, transmission, distribution, metering and billing. Starting in the 1970s and 1980s, nations began the process of deregulation and privatisation, leading to electricity markets. The distribution system would remain regulated, but generation, retail, and sometimes transmission systems were transformed into competitive markets. Simplified diagram of AC electricity delivery from generation stations to consumers' service drop. Electric power begins at a generating station, where the potential difference can be as high as 13,800 volts. AC is usually used. Users of large amounts of DC power such as some railway electrification systems, telephone exchanges and industrial processes such as aluminium smelting use rectifiers to derive DC from the public AC supply, or may have their own generation systems. High-voltage DC can be advantageous for isolating alternating-current systems or controlling the quantity of electricity transmitted. For example, Hydro-Québec has a direct-current line which goes from the James Bay region to Boston. From the generating station it goes to the generating station’s switchyard where a step-up transformer increases the voltage to a level suitable for transmission, from 44kV to 765kV. Once in the transmission system, electricity from each generating station is combined with electricity produced elsewhere. Electricity is consumed as soon as it is produced. It is transmitted at a very high speed, close to the speed of light. General layout of electricity networks. The voltages and loadings are typical of a European network. 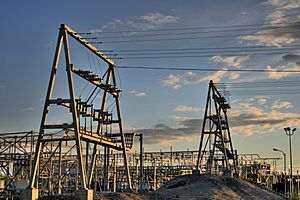 Circuit breakers and switches enable the substation to be disconnected from the transmission grid or for distribution lines to be disconnected. Transformers step down transmission voltages, 35kV or more, down to primary distribution voltages. These are medium voltage circuits, usually 600-35,000 V.
From the transformer, power goes to the busbar that can split the distribution power off in multiple directions. The bus distributes power to distribution lines, which fan out to customers. Urban distribution is mainly underground, sometimes in common utility ducts. Rural distribution is mostly above ground with utility poles, and suburban distribution is a mix. Closer to the customer, a distribution transformer steps the primary distribution power down to a low-voltage secondary circuit, usually 120/240 volts in the US for residential customers. The power comes to the customer via a service drop and an electricity meter. The final circuit in an urban system may be less than 50 feet, but may be over 300 feet for a rural customer. Primary distribution voltages range from 4 kV to 35 kV phase-to-phase (2.4 kV to 20 kV phase-to-neutral) Only large consumers are fed directly from distribution voltages; most utility customers are connected to a transformer, which reduces the distribution voltage to the low voltage "utilization voltage", "supply voltage" or "mains voltage" used by lighting and interior wiring systems. Distribution networks are divided into two types, radial or network. A radial system is arranged like a tree where each customer has one source of supply. A network system has multiple sources of supply operating in parallel. Spot networks are used for concentrated loads. Radial systems are commonly used in rural or suburban areas. Radial systems usually include emergency connections where the system can be reconfigured in case of problems, such as a fault or required replacement. This can be done by opening and closing switches. It may be acceptable to close a loop for a short time. Long feeders experience voltage drop (power factor distortion) requiring capacitors to be installed. Rural electrification systems tend to use higher distribution voltages because of the longer distances covered by distribution lines (see Rural Electrification Administration). 7.2, 12.47, 25, and 34.5 kV distribution is common in the United States; 11 kV and 33 kV are common in the UK, Australia and New Zealand; 11 kV and 22 kV are common in South Africa and China. Other voltages are occasionally used. Distribution in rural areas may be only single-phase if it is not economical to install three-phase power for relatively few and small customers. Rural services normally try to minimize the number of poles and wires. Single-wire earth return (SWER) is the least expensive, with one wire. It uses higher voltages (than urban distribution), which in turn permits use of galvanized steel wire. The strong steel wire allows for less expensive wide pole spacing. In rural areas a pole-mount transformer may serve only one customer. In New Zealand, Australia, Saskatchewan, Canada, and South Africa, single-wire earth return systems (SWER) are used to electrify remote rural areas. Higher voltage or three phase service, at a higher infrastructure and a higher cost, provide increased equipment efficiency and lower energy cost for large agricultural facilities, petroleum pumping facilities, or water plants. In other rural areas, a "4-wire" system is used but, to reduce the number of conductors, the 4th neutral wire is connected to the ground to use that as a return (an unground wye system). 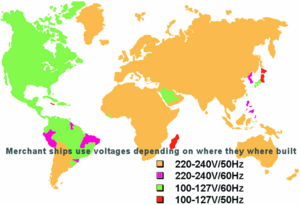 Electricity is delivered at a frequency of either 50 or 60 Hz, depending on the region. It is delivered to domestic customers as single-phase electric power In some countries as in Europe a three phase supply may be made available for larger properties. Seen in an oscilloscope, the domestic power supply in North America would look like a sine wave, oscillating between -170 volts and 170 volts, giving an effective voltage of 120 volts. Three-phase power is more efficient in terms of power delivered per cable used, and is more suited to running large electric motors. Some large European appliances may be powered by three-phase power, such as electric stoves and clothes dryers. A ground connection is normally provided for the customer's system as well as for the equipment owned by the utility. The purpose of connecting the customer's system to ground is to limit the voltage that may develop if high voltage conductors fall down onto lower-voltage conductors which are usually mounted lower to the ground, or if a failure occurs within a distribution transformer. Earthing systems can be TT, TN-S, TN-C-S or TN-C. Most of the world uses 50 Hz 220 or 230 V single phase 400V 3 phase for residential and light industrial services. In this system, the primary distribution network supplies a few substations per area, and the 230 V power from each substation is directly distributed. A live (hot) wire and neutral are connected to the building for each phase of three phase service. Single-phase distribution is used where motor loads are light. In Europe, electricity is normally distributed for industry and domestic use by the three-phase, four wire system. This gives a three-phase voltage of 400 volts wye service and a single-phase voltage of 230 volts. In the UK a typical urban or suburban low-voltage substation would normally be rated between 150 kVA and 1 MVA and supply a whole neighborhood of a few hundred houses. For industrial customers, 3-phase 690 / 400 volt is also available, or may be generated locally. Large industrial customers have their own transformer(s) with an input from 11 kV to 220 kV. Most of the Americas use 60 Hz AC, the 120/240 volt split phase system domestically and three phase for larger installations. North American transformers usually power homes at 240 volts, similar to Europe's 230 volts. It is the split-phase that allows use of 120 volts in the home. In the electricity sector in Japan, the standard frequencies for AC are 50 and 60 Hz. Parts of the country use 50 Hz, while other parts use 60 Hz. This is a relic of the 1800s. Some local providers in Tokyo imported 50 Hz German equipment, while the local power providers in Osaka brought in 60 Hz generators from the United States. The grids grew until eventually the entire country was wired. Today the frequency is 50 Hz in Eastern Japan (including Tokyo, Yokohama, Tohoku, and Hokkaido) and 60 Hertz in Western Japan (including Nagoya, Osaka, Kyoto, Hiroshima, Shikoku, and Kyushu). Most household appliances are made to work on either frequency. The problem of incompatibility came into the public eye when the 2011 Tōhoku earthquake and tsunami knocked out about a third of the east’s capacity, and power in the west couldn’t be fully shared with the east, since the country does not have a common frequency. There are four high-voltage direct current (HVDC) converter stations that move power across Japan’s AC frequency border. Shin Shinano is a back-to-back HVDC facility in Japan which forms one of four frequency changer stations that link Japan's western and eastern power grids. The other three are at Higashi-Shimizu, Minami-Fukumitsu and Sakuma Dam. Together they can move up to 1.2 GW of power east or west. Most modern North American homes are wired to receive 240 volts from the transformer, and through the use of split-phase electrical power, can have both 120 volt receptacles and 240 volt receptacles. The 120 volts is typically used for lighting and most wall outlets. The 240 volt outlets are usually located to service the oven and stovetop, water heater, and clothes dryer (if they are electric, rather than using natural gas). Sometimes a 240 volt outlet is mounted in the garage for machinery or for charging an electric car. 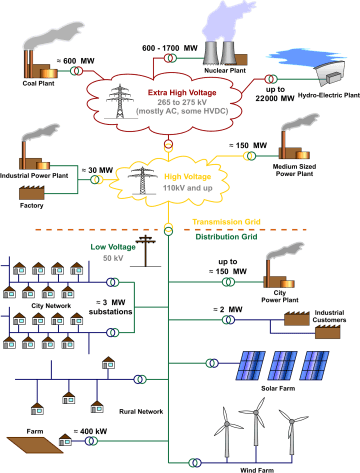 Electric power distribution Facts for Kids. Kiddle Encyclopedia.